Colleges in APCo territory want to use PPAs to install solar facilities like the one recently installed at the University of Richmond, in Dominion territory. Facing a withering report from a Virginia hearing examiner recommending denial of its request for a renewable energy “Rider RGP,” Appalachian Power Company (APCo) has responded with a simple message to the State Corporation Commission: um, never mind. APCo proposed Rider RGP as an alternative to third-party power purchase agreements (PPAs) for customers wanting to install rooftop solar. The proposal would have put APCo in the middle of the deal and created a buy-all, sell-all scheme. But the proposal was roundly criticized at last year’s hearing and in witness statements as convoluted and expensive. On September 19 APCo asked to withdraw its application, citing changed circumstances. In reality, of course, nothing has changed since the Hearing Examiner’s August 31 report, other than APCo learning it was about to lose. The company probably doesn’t mind being rejected for a program that witnesses said no one would sign up for. The much bigger issue for the company is that if the SCC adopts the hearing examiner’s view, APCo could lose its battle to block PPAs in its service territory. For those of you just coming to the story, here’s the Cliff Notes version (this earlier post has the unabridged telling): APCo’s customers want the ability to install solar on their property through PPAs, a financing arrangement in which a solar developer installs and owns the panels, selling the electricity that’s generated to the customer. Often this means the customer can reduce its electricity bills without incurring an up-front cost. For tax-exempt institutions like colleges that can’t take advantage of the federal 30% tax credit for solar, the PPA model means the developer can take the tax credit and pass along the savings. Virginia utilities say this arrangement violates their monopoly on the sale of electricity. Customers point to two statutory provisions that make PPAs legal. One provision allows customers to buy renewable energy from third parties if their utility doesn’t offer it. (No utility in Virginia does.) The other provision defines a net metering customer to include one who contracts with someone else to install and operate a solar facility on the customer’s property—an apt description of a PPA arrangement. Customers would seem to have the better of the argument, surely, but no bank will finance a PPA when a deep-pocketed utility is threatening to sue. Dominion temporarily settled the issue in its territory with a pilot program that allows some PPAs, but APCo declined to participate. Under pressure from educational institutions that want solar, APCo proposed Rider RGP as an alternative for its territory. Customers and solar advocates seized the opportunity to seek a clear ruling from the SCC on the legality of PPAs. They argued, and the Hearing Examiner agreed, that Rider RGP wasn’t just badly designed, but unnecessary, given the provisions of the statute that already allow PPAs. APCo doesn’t want the SCC commissioners to confirm this conclusion. It hopes that by withdrawing Rider RGP, the SCC will dismiss the case and not reach the merits of the argument on PPA legality. It is urging the SCC not to consider the point at all, or if it does so, not to take it up until it considers APCo’s plan, announced in April, to offer a green tariff to customers. That green tariff is the “changed circumstances” APCo says makes Rider RGP unnecessary. If the SCC approves the green tariff, APCo will offer to sell real renewable energy to customers who want it. APCo clearly believes that having that tariff available to customers closes off the statutory provision that allows customers to go to third-party sellers if their own utility doesn’t offer renewable energy. The green tariff would not, however, affect the legality of PPAs under the other statutory provision, the one that defines net metering customers to include those who have renewable energy facilities located on their property but owned and operated by someone else. Nor does the offer of a green tariff seem likely to satisfy customer demand for PPAs; buying electricity from a utility through a green tariff is a very different animal from having solar panels on your own roof. The SCC is considering APCo’s request to withdraw its proposal for Rider RGP. It issued an order asking the parties to the case to comment by September 26. Advocates are expected to oppose APCo’s request and to ask the SCC to rule definitively on the legality of PPAs. By doing so, the Commission would finally bring legal clarity to an issue that has been holding back solar development in Virginia. Update: September 26, Dominion Virginia Power filed a motion to intervene out of time, with a brief begging the SCC not to even look at the legality of PPAs, or if it did, to reject the hearing examiner’s reading of the statute on the grounds that her opinion disagrees with Dominion’s. Dominion’s brief notes that it wrote its own opinion into a tariff, which the SCC approved, and therefore that ought to be more important than whatever the General Assembly actually said. On October 7, the SCC allowed APCo to withdraw its proposal, ducking the issue of PPA legality and ensuring that more time and money will be wasted on future proceedings. Virginia is poised to see hundreds of megawatts of new solar built in 2016, an enormous acceleration from today’s 20-or-so. Some of this is the result of recent utility commitments, but the rest represents demand from the private market. And there’s a catch: many of these projects could be tripped up or squelched altogether by unnecessary policy barriers. The list of projects shows just how broad the appeal of solar has become, and how all parts of the Commonwealth will benefit. On the utility side, Dominion Virginia Power’s solar plans include the 20 MW Remington project, another 56 MW from three projects it plans to buy from developers, and 47 MW worth of power purchase agreements with third-party developers. * Old Dominion Electric Cooperative is building two projects totaling 30 MW to serve its member cooperatives, and Appalachian Power has put out a request for proposals for 10 MW of solar. More recently, the Council of Independent Colleges of Virginia (CICV) issued a request for proposals for up to 38 MW of solar spread among its fourteen members statewide. Beyond these projects, grid operator PJM Interconnection lists hundreds of MW of Virginia solar in its “queue”—projects mostly still on the drawing board, but reflecting the desire of developers to build and sell solar in Virginia. The new-found popularity of Virginia solar is not limited to multi-megawatt projects like these. Residential solar is also growing rapidly, in part due to the discount “solarize” programs popping up all across the state. In addition, projects on low-income housing and on schools in Albermarle, Lexington, Arlington and elsewhere have turned civic leaders into proponents. While customers like the social and environmental benefits of solar, virtue isn’t bankable; the real driving force here is economics. The price of solar panels has declined so much that Dominion Power touted savings on electric bills as the reason residents should support its plans for a Louisa County solar farm. Yet what’s holding back the market is a list of policies in place because Virginia utilities opposed the growth of solar for so long. At first utilities said they wanted to protect the grid from the unknown effects of intermittent generation. Now, having gotten into the act themselves, they are more concerned with protecting their monopolies from the known effects of competition. The result is years of projects going to other states, and a very damaging level of market uncertainty today. 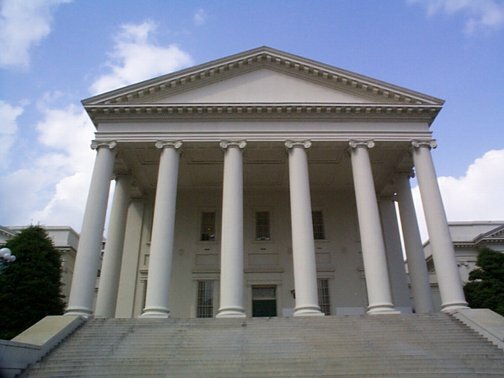 For example, some of the CICV members won’t be able to proceed unless the State Corporation Commission rejects the utilities’ contention that third party power purchase agreements (PPAs) violate Virginia law outside the narrow confines of a pilot project Dominion negotiated in 2013, or the General Assembly acts to bring clarity to the law. And all of the colleges are constrained by legal limits on the size of the projects they can install. In addition, Virginia limits the size of net-metered renewable energy projects to 1 megawatt (up from 500 kilowatts last year, but still below the 2 MW limit that the industry sought), and places an overall cap on these projects of 1% of a utility’s overall sales. Residential projects are limited to 20 kilowatts, with systems sized between 10 and 20 kW subject to punitive standby charges. Commercial and residential projects are limited to just the size required to meet a customer’s demand based on the previous year’s electricity usage, unfairly constraining customers who plan to expand or buy electric vehicles. With so much interest in the Virginia solar market, these barriers only hurt the state in its efforts to attract new businesses and development. Even two years ago, more than 60% of Fortune 100 companies had adopted renewable energy procurement and greenhouse gas reduction goals. Household names like Walmart, Johnson & Johnson, Proctor & Gamble and Goldman Sachs have pledged to source 100% of their electricity from renewable energy. More companies are expected to join them, creating opportunities in states that want to accommodate them. Yet the only reason Amazon could proceed with its Virginia project was because the developer arranged to sell the power into the grid in Maryland, beyond Dominion’s reach. The fact that Dominion’s parent corporation then bought the project and the PPA for its own investment portfolio underscores the hypocrisy of our utilities in opposing other companies’ right to enter PPAs. Writing last week, energy consultant and developer Francis Hodsoll argues that Dominion Virginia Power actually needs a thriving private market to help it establish the market price of solar, which it can use to justify its own projects to regulators. Utility-owned solar and private investments are not an either/or proposition. Virginia is at the bare beginning of the clean energy transition, and there are plenty of opportunities for all—if our leaders will take down the walls. *The State Corporation Commission’s rejection of Dominion’s plan to build and own the Remington plant means a cloud still hangs over plans for that project as well as the three projects making up the 56 MW package. But apparently the clever legal minds at Dominion have a plan. The gist of it is that they will use pricing from the 47 MW of PPA solar to demonstrate the company isn’t overspending, which will meet the requirement that the company consider market alternatives. Now all that remains is to get the blessing of the IRS to allow them to use the federal tax credits as effectively as a third-party developer could. I seem to be the only one to regard that last detail as a hitch. Other than that, though, I’m impressed. Dominion ratepayers can be proud that their money pays the salaries of people so skilled in manipulating energy laws and tax codes. Just imagine what could be achieved if all that talent were put to work improving Dominion’s abysmal record on energy efficiency and renewable energy.